In places with little to no human presence, the mid-day "lull" can be a perfect time to hunt coyotes and other predators. Rich Higgins and his three partners did everything right. With that many hunters, it’s tough to get into position without blowing every coyote out of the country, but they eased into their stand with the wind in their face, settled in without so much as a whisper, and pulled camouflage down over their heads and hands. Everything was just right, so Higgins’ son got ready to call. That’s all it took. In a matter of seconds, two coyotes raced in so fast, no one was prepared for what could have been a sure double. Instead, four hunters were left scratching their heads and wondering where they went wrong as two predators vanished over a hill in a cloud of dust. That was the last time Higgins and his son made that mistake, but close and sudden encounters are part of the action when you hunt coyotes in the middle of the day. Higgins and South Dakota hunter Matt Barnard spend countless days on the road in pursuit of predators. They hunt hard, often calling from first light to the very last minutes of the day. More often than not, they eat on the run, never wasting a valuable minute, even if it falls in the middle of the day. 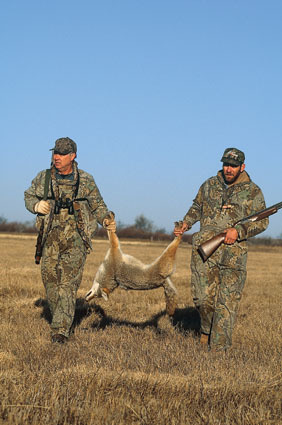 Coyotes are a little tougher to bring into gun range when the sun is high, admit both hunters, but with a few adjustments, mid-day hunting can be just as effective as an early morning hunt. Coyotes, like most predators, are nocturnal, preferring to hunt under the cover of darkness. In some situations, however, they’ll gladly cruise open pastures and other sparse cover in search of mice, rabbits and other meals in the middle of the day. Higgins, who has on occasion worked closely with biologists, says daytime activity by coyotes has more to do with human activity than anything else. In areas with little or no hunting pressure – whether direct pressure by predator hunters or indirect pressure from bird or deer hunters – coyotes are just as likely to be up and around at noon as they are at midnight. John Shivac, research biologist with USDA’s Wildlife Research Center in Logan, Utah, says coyotes in harsh winter environments prefer to hunt in the daytime. The snow cover is softer, and catching mice under that snow is much easier. However, in places with lots of predator or deer hunters, coyotes seem to vanish, burrowing down into thick cover until a blanket of darkness allows them the freedom to move without fear. With that in mind, Higgins and Barnard pay careful attention to where they set up when they prepare to call. What matters most, they agree, is making predators feel safe and comfortable about approaching your position. “It’s amazing how much more that matters in the daytime than it does early and late in the day, especially in areas where they’ve been hunted or shot at by ranchers,” says Higgins. In other words, nothing signals trouble to a coyote more than roads, buildings and specific places that are popular with varmint hunters. Predators avoid those places. Higgins recalls numerous occasions where he found the perfect vantage point for a calling session only to find several empty shell casings from a .22 caliber centerfire rifle. The spot appealed not only to him, but to other hunters, as well. He didn’t bother to stay and give it a try. Now Higgins does everything he can to call as far away from roads and other areas that might put a coyote on alert in the middle of the day. He’ll even make the extra effort by walking a long way to get on the opposite side of a bedded predator, anything it takes to put that dog at ease. It’s made a huge difference in his mid-day hunting success. Both he and Barnard avoid calling areas in the middle of the day where predators have to cross open fields or walk on ridges or exposed hillsides in order to approach their positions. Barnard says they just won’t come across wide-open areas in the daytime. He lives in the open grassland country of southeast South Dakota, and has on many occasions seen coyotes bedded down on open hillsides in the middle of the day. They were either too far from a road for a rifle shot or in places where they weren’t hunted, so they felt comfortable. During periods of extreme cold, coyotes are most likely to bed on south-facing hillsides where they can take advantage of the afternoon sun. You normally find them in cooler, shaded draws and in standing crops during the hotter months. Except for the spring when they are bearing litters, coyotes won’t use underground dens much. Instead, they’ll lie down on the ground or they’ll utilize brush piles, hay bales and other surface cover, even if it’s man-made. Any cover that allows them feel secure should be considered a bedding spot and is worthy of a calling session. Both Higgins and Barnard say it takes on-the-ground experience to figure out what type of habitat coyotes in your area use as bedding cover. Only by hitting as many areas as you can, then analyzing the results, will you be able to narrow down your search. In most cases, mid-day habitat can be pretty easy to spot. Thickets far from roads, brushy draws in rugged country and hilltops, especially ridges and points with some vegetation to serve as cover, are all prime places to seek daytime coyotes. The trick, says Higgins, is to get right in the middle of their bedrooms if you want to lure a coyote into gun range in the middle of the day, particularly in areas with high hunting pressure. When he hunts the desert country around his home in Arizona, Higgins looks for brushy draws and fields of standing crops, especially when it’s real hot. Green crops not only provide cover, they provide cooler air in the form of shade, an important ingredient for desert dogs. Standing crops, however, tend to mute the sound of a call, even a loud one, so Higgins suggests working a field from at least two sides in order to cover it thoroughly. “You have to assume a coyote is less 50 yards away every time you sit down to call, because there very well might be one that close if you get into the thickest cover and other places they like to bed,” says Higgins. Getting close to a bedded coyote is a tough task in itself. All predator hunters have to be careful when they cross open ground, but trying to get close to a pack loafing on a hillside can be just about impossible. That’s one reason Higgins focuses on brushy draws and thick fields of standing crops. 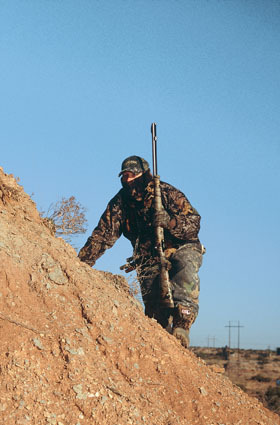 They are easier to approach than wide open spaces, where any movement is certain to be seen by bedded coyotes. He always walks in with the wind at his face and he never makes a sound once he gets near the spot he expects to pull a coyote out of. Both hunters treat mid-day coyotes much as they would treat them at any other time – they start out with a series of quiet calls, followed by an increasingly louder run. Wounded rabbits scream pretty loud, acknowledges Barnard, but starting out too loud might spook a close coyote. He often starts with a Knight & Hale mouse squeaker. “You can always turn up the volume if you don’t get a response from your first series of calls. When I’m calling a coyote that I think is close, I want to grab his curiosity and get him wondering about the sounds I just made. That curiosity factor is real important when they are bedded and aren’t necessarily interested in feeding. A squeaker is perfect for that,” says Barnard. While Barnard will use a howler to help locate coyotes in the middle of the day, Higgins tends to stick with food-based calls such as wounded rabbits, birds in distress, mouse squeakers and even fawn deer bleats. He says groups of coyotes have reassembled by morning, and locator calls such as howls and yips usually don’t elicit much of a response. Barnard, however, says they may draw a coyote out of his bedding cover just for a second as it searches for the intruder. 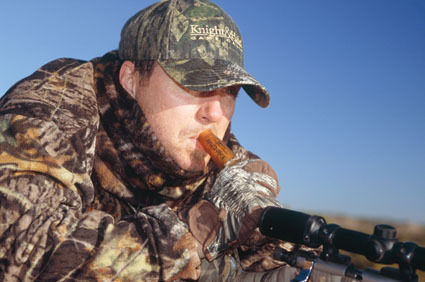 Most of the time, however, he’ll do the same thing as Higgins – use a howler early in the morning, often before first light, to get a bead on the coyotes, and then come back and work them throughout the day. However, both agree that when things are tough, it never hurts to try everything you can throw at them. In other words, coyotes that were there a few hours ago may be gone, so if you don’t draw any interest from a dog or two in the middle of the day, it may be because they just aren’t there. Still, hunting predators at high noon beats hanging around the house or wasting away hours in a local diner. The coyotes are out there somewhere and if you make a few changes to your tactics, you can score, no matter how high the sun.